Ye Olde Bluestone dwelling built in the 1800’s had fallen by the wayside in dire need of restoration before completely succumbing to mother nature’s grasp. The plan – Restore the original stonework to its former glory using traditional building methods and mortar, re-point the entire building, add a roof and some clever carpentry and presto, a functional guest stay for the owners of this property. Stonehedge also gave the ‘freshwater’ pool area a facelift. The busy looking original stonework was replaced by handcrafted sandstone machined on site and installed with neat and tidy lineage throughout. Originally built in the 1800’s this cottage, now without a roof for protection from the weather for some years, was slowly deteriorating. 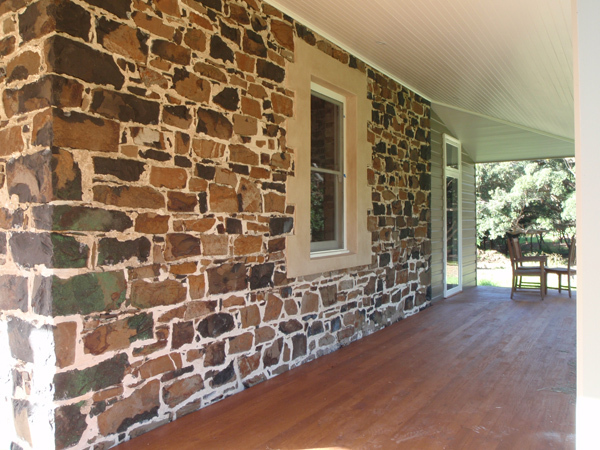 Built using local bluestone and lime mortar, Ken Sandy saw the benefits of restoring part of the heritage of the area.